For people with limited eyesight, this reading magnifier reduceseyestrain. Enlarges whole paragraphs at a time to 2X their originalsize. 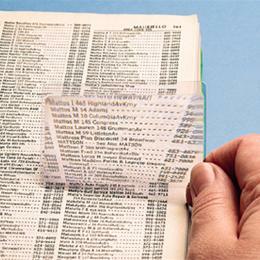 Made of flexible plastic, it is small enough to fit into a shirtpocket or purse, can be used as a bookmark.